Since NBA Live 95, the East and West All-Stars have been playable in EA Sports’ basketball game series. 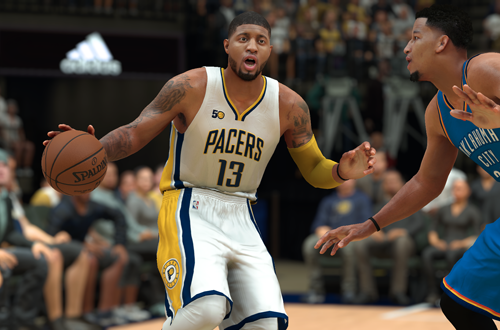 In fact, they were also available in NBA Live’s forerunner, the NBA Playoffs series. 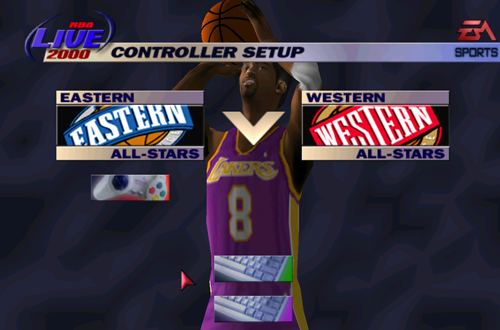 However, if you scroll through the selection of teams in NBA Live 2000’s default rosters, you’ll find the brand new Decade All-Star squads, but no East and West All-Stars. The art and audio assets for both teams are in NBA Live 2000, since they are playable in Season and Franchise Mode, but out of the box, you can’t play an exhibition All-Star Game. What gives? Did the development team simply forget to include them? Is there some great conspiracy at work here? Actually, it was a hangover from the previous year’s lockout. While the lockout affected NBA Live 99 more directly, forcing it to ship with final 1998 season rosters, it still had ramifications for NBA Live 2000. Traditionally, the previous season’s All-Star squads are available in the default rosters, but given that the 1999 All-Star Weekend was cancelled due to the lockout, that wasn’t possible. It’s interesting that EA didn’t just go back a season and include the 1998 All-Star teams though, especially as they had just licensed Michael Jordan to appear as a Legend. For once, they wouldn’t have had to use a Roster Player in the default All-Star teams. “NBA Live Has Shaq!” That might seem like a strange marketing point to include on the back of a box, especially when the cover player is actually Mitch Richmond. However, that’s what NBA Live 97 proudly proclaimed, and for good reason. At the time, Shaquille O’Neal was exclusive to EA Sports’ basketball game. Sure, His Airness and Sir Charles were absent, but no one was able to lock them down. Shaq was a huge star too, and only EA had him. If you were playing NBA Full Court Press, NBA ShootOut ’97, or NBA Hangtime, and you wanted to play with The Diesel, you were out of luck. It had to be NBA Live 97…or Shaq Fu, I suppose. 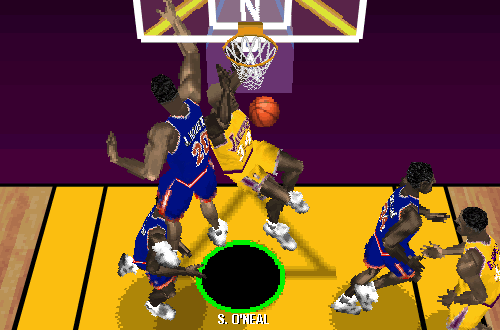 O’Neal had also been exclusive to NBA Live 96, appearing on the cover of the PC and PlayStation versions, though his exclusivity wasn’t mentioned on the box as a selling point. This meant that he was replaced by a Roster Player in both the ’96 and ’97 versions of NBA ShootOut. In NBA Full Court Press, released for the 1997 season but featuring 1996 rosters, he was simply absent from the Orlando Magic and East All-Stars. Shaq would appear in every sim-oriented basketball game from the 1998 season onwards, but thanks to his inclusion in those early NBA Live games, he’s appeared in at least one basketball game every year for over two decades. Alright, this one’s probably common knowledge, but I remember being a little confused by it when I was younger and less informed about developers and publishers. 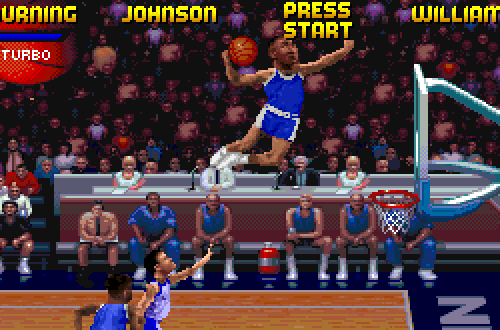 Back in the mid 90s, I originally believed that NBA Jam – and for that matter, Mortal Kombat – were made by Acclaim. This is because I was playing the PC and Super Nintendo versions of those games, and Acclaim was the publisher of those ports. The original arcade versions were of course developed by Midway, so while we have Acclaim to thank for bringing those classics to the home market, it is in fact Midway that deserves credit for creating them in the first place. Unfortunately for Midway, Acclaim surprisingly managed to wrest the NBA Jam name away from them, and proceeded to develop their own series of Jam games. Midway’s game remained the superior product, however, with many considering NBA Hangtime to be the true successor to NBA Jam Tournament Edition, rather than NBA Jam Extreme. Further Jam titles by Acclaim continued to disappoint and Midway also eventually stopped releasing sports games, with both companies now defunct (though Midway does live on as NetherRealm Studios). The trademark was eventually picked up by EA Sports, leading to the 2010 reboot and On Fire Edition; both great games. There’s an interesting situation brewing with Kyrie Irving’s trade demand, as he’s set to appear on the cover of NBA 2K18. If he does get dealt, it would mark only the third time that a cover player for a basketball game has changed teams that same season. The other two are Stephon Marbury (NBA ShootOut 2002), who actually changed teams before the game even came out, and Ray Allen (NBA ShootOut 2003). If Irving does get traded soon, it remains to be seen whether 2K will change the cover before release, if at all. Notably, Marbury was traded to the Suns in July 2001, but still wears a Nets jersey on the cover of ShootOut2002, released in September. Several other players have changed teams within a year of appearing on the cover of a basketball game. That list includes Shaquille O’Neal (NBA Live 96, and again after NBA Inside Drive 2004), Sam Cassell (NBA ShootOut), Shawn Kemp (NBA Jam Extreme), Glen Rice (NBA In the Zone ’98, though he also appeared on the cover of NBA In The Zone ’99), Vince Carter (NBA Live 2004), Tracy McGrady (NBA ShootOut 2004), LeBron James (NBA 2K14), and most recently, Paul George (NBA 2K17). Basketball games may not share Madden’s infamous “Cover Curse”, but their cover players do have a tendency to move around. Market-based titles are not an uncommon phenomenon across different types of media, and occasionally, a basketball game has been given a new name. It doesn’t happen very much anymore, but over the years, a couple of basketball game series and some standalone titles have been renamed in certain regions. The aforementioned NBA ShootOut series was known as Total NBA in PAL regions. Konami’s NBA In the Zone series was renamed NBA Pro in Australia, and NBA Power Dunk in Japan. Similarly, Double Dribble’s Japanese title is Exciting Basket. In English-speaking countries at least, a lot of the title changes do seem unnecessary. In some cases, it was probably done to create distinct branding. For example, Visual Concepts’ forerunner to NBA 2K was named NBA Action ’98 on PC and SEGA Saturn, and NBA Fast Break ’98 on the PlayStation. 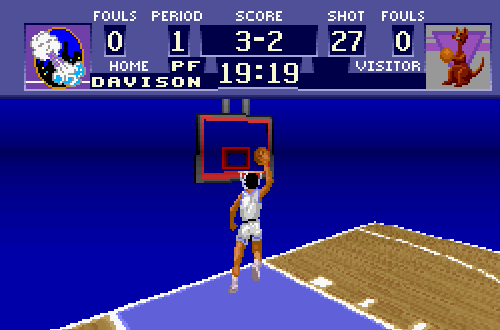 Perhaps the most interesting example is Sculptured Software’s 1992 release that was known as NCAA Basketball in North America, World League Basketball in PAL regions, and Super Dunk Shot in Japan. It was therefore a college basketball game in North America, a knock-off NBA game in Japan, and a fictional international basketball league game for PAL gamers. With most renamed games, however, the content didn’t change between versions. Have you got anything to add those trivia items (including any corrections)? Do you have any other interesting, random facts to share about a basketball game? Let me know in the comments section below, and as always, feel free to take the discussion to the NLSC Forum! That’s all for this week, so thanks for checking in, have a great weekend, and please join me again next Friday for another Five.